We haven't done a pop-up shop since last November so we are SO excited to say...We're joining forces with some of the very best talent in Kansas City for a one night only event! 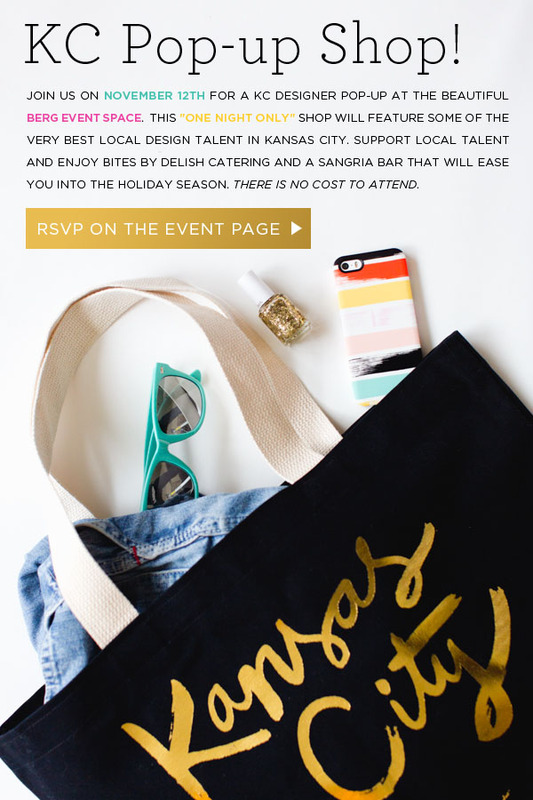 Join us on November 12th from 5-9pm for a KC designer pop-up at the one and only Berg Event Space. 1525 Grand Boulevard, KCMO. Support local talent and enjoy bites by Delish Catering and a sangria bar! Yes, you read that correctly, sangria bar! Check out this list of designers that will be there along with us: Janesko, Heidi Herrman Design, TOMBOY, Alicia Janesko - Caftans and Resort Wear, Earthen Vessel Designs, Amina Marie Millinery, ENVE Designs, RubiaRojo, Native Atlas, Nickel and Suede, Lily Dawson Designs, Happy Habitat by Karrie Kaneda, Plaza Aesthetics, Cheryl Eve Designs, Ampersand Design Studio, Dolyn Bags, LLC, Oblivion Clothing Design, Asiatica | Kansas City, Golden & Pine and Indian Summer Collection! And guess what? There is no cost to attend! We hope you all can get a jump on your holiday shopping and stop by and see us! We fully support the "one for you, one for me" shopping mentality. Come treat yo self! Stop by the event page for more details and to rsvp! Today we get to share a project with you that is so very near and dear to our hearts. 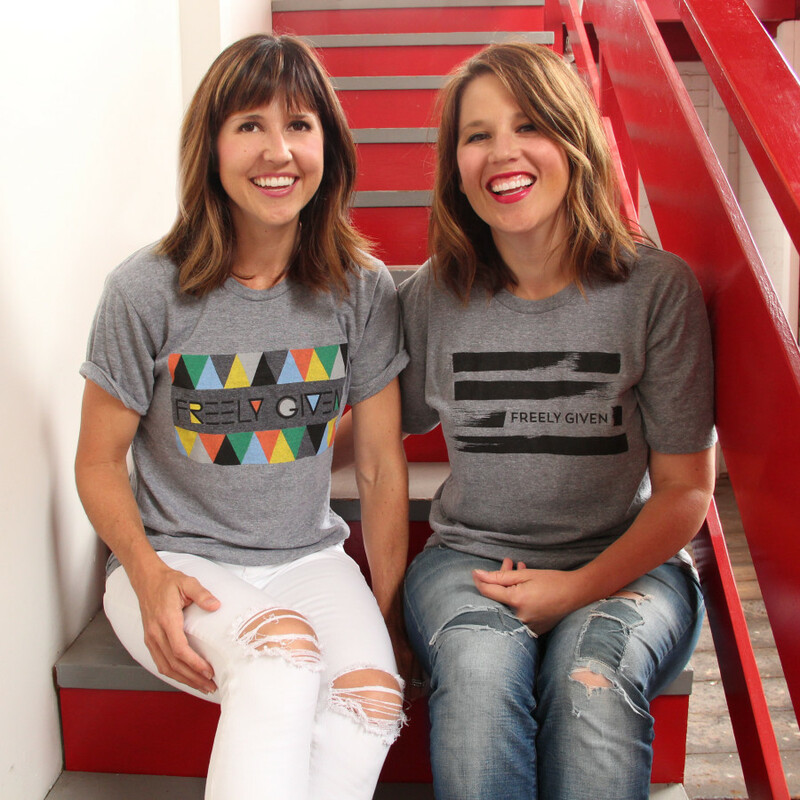 We were introduced to the Freely Given Movement at the beginning of the year when our sweet friend, Allison Corrin, emailed, telling us of a dream she and her husband, Chris, shared to help people going through hardship. She shared with us the first story they had chosen to tell, the first family to support —The Van Sickle family. Allison had used her amazing photography talent to share their three-year-old daughter, Kit's, story visually, and as we watched, the tears ran down our cheeks. We were so thankful to know of Kit's story and couldn't wait to share it anywhere possible, as is the goal of the project. 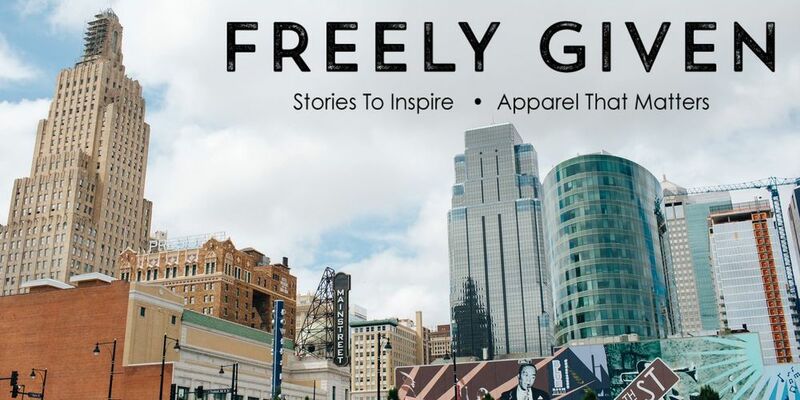 The way they describe Freely Given is as "a social enterprise created to rally community behind families in crisis through the power of social media and the sale of uniquely designed apparel." To say that we are honored to have had the opportunity to create the first shirt designs for their campaign is an understatement. Supporting a cause born of such caring and compassion truly makes our work worthwhile. Meet three year-old Kit. 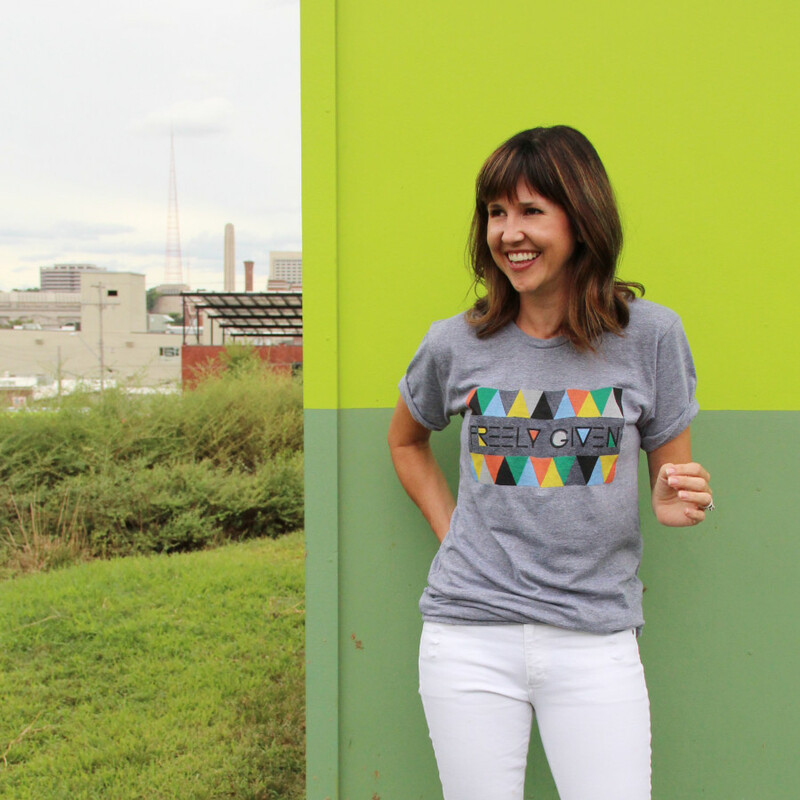 Learn more about her story and how 90% of profits from the Go Kit Go collection will go towards providing for her in home care. In Allison's words after spending the day documenting Kit's family: "They had met many others walking these days, months, years ahead of their story, but the journey was often the same. Children were around them daily, flesh failing yet spirit thriving, strength exemplified. They had also met those broken. Destroyed by disappointment, hope burnt out, souls empty. Yet, Kit's choice has been made from the beginning. They'll carry hope wherever they go, they won't let go of faith. And when they can't, their people will carry them. ""As unique as each of our stories are, we can find a unifying theme in the journey. We celebrate together in the peaks, in the joyful times, where we have received and are full. But then for many of us, unavoidable landslides occur along the way somewhere. We find ourselves caught up in hardships - stretched in every sense of the word. The valleys close in, the bottom of our financial capabilities reached, drained by medical expenses, a job suddenly gone, transportation finally on it’s last mile, a loved one lost, or perhaps it is everything that has come at us at once, and fast. This is when unity must prevail. This is the time to come alongside, to build community, to hand-in-hand give freely to those traveling through a valley of their story." We hope that you take the time to watch Kit's video and check out the shirts that you can get to help this amazing family! You guys....THIS is what it's all about. We couldn't be happier to use our talents to help support a business like this!! Check out the shirts below. We just want to give a big shout out to Her Life Magazine!! 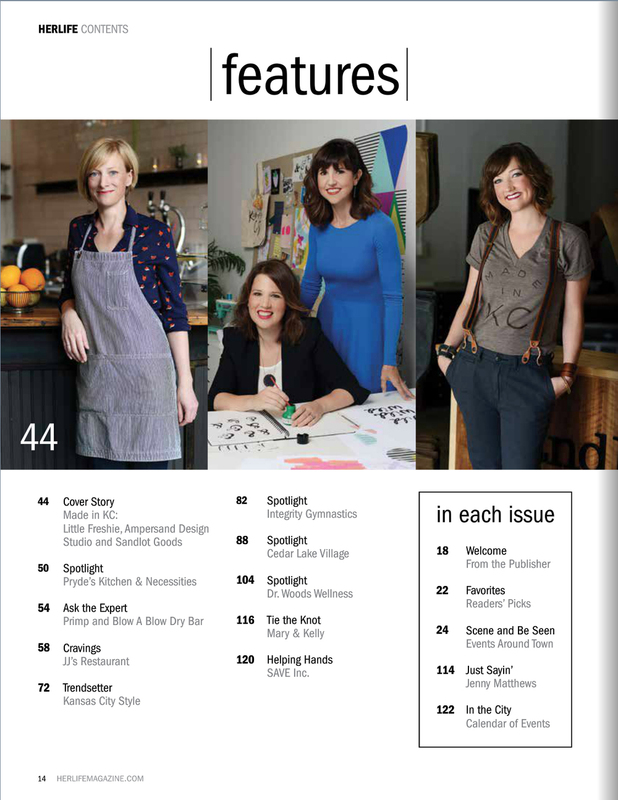 We are so incredibly proud to be a part of the August 2015 issue which is the annual Made in KC feature! With each of us growing in Kansas City and making a conscience choice to live here and start a business in KC, we are truly "made in KC"! And we can't go without mentioning that we're so proud to be included in this issue along with Little Freshie and Sandlot Goods, owned by two inspiring biz ladies! Hope you all pick up a copy! Huge hugs to Made in KC and Coveted Home for bringing together Kansas City's creative minds for a night of mingling with old and new friends. We keep up to date with the creative community on social media, but nothing compares to being able to have a conversation in person...and the fabulous menu & drinks didn't hurt either! Cheers to you guys!